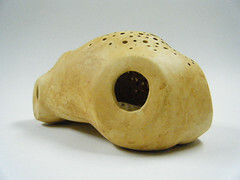 February 18 – April 2, 2011 at Abecedarian Gallery in Denver, CO, USA. The focus of the exhibition is on narrative sculptural works and books that incorporate clay as a primary element in their production. The exhibition includes works by US artists Al Shenk, Alicia Bailey, Andrea Peterson, Andrew Eastwood, Judith Serebrin, Katie Taft, Marie EvB Gibbons and Steve Gordon. Denver artists Steven Gordon is the featured artists in this exhibition. 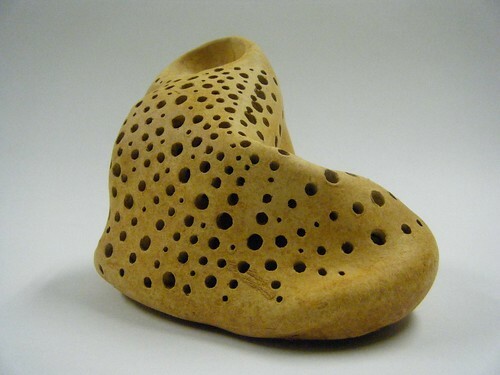 On display are several new stoneware works in which he explores the limits of elasticity of his material as something representative of the human spirit. Bending vessel forms to near, but not quite, breaking points Gordon then repeatedly pierces the forms, pushing even further the boundaries of what physicality can absorb while maintaining form – this delicate balance then held in place by firing. Also exploring the limits of the materials, Pennsylvania artist Andrew Eastwood pushes porcelain to the limit in terms of thinness. A collection of thin, delicate panels is presented in a book whose rigid pages function as mounting supports for the extremely fragile panels. More obviously narrative are two works by California artist Al Shenk based on dreams he has had. 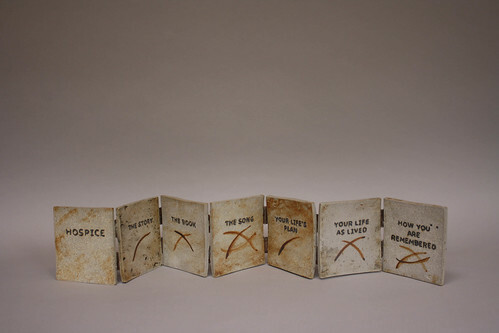 In Hospice, the heft of the high-fire stoneware pages enhances the heaviness of his dream of being in a hospice ward. 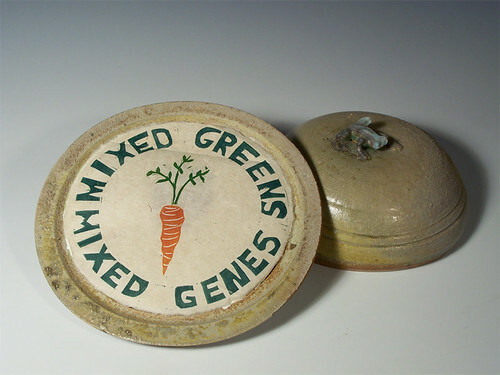 Less purely ceramic are works by Denver based Katie Taft. Katie works in photography, sculpture and what ever else it takes to get the job done. Her work deals with universal stories such as myth and folklore, philosophy and religion and how these kinds of stories manifest themselves in our modern lives. On display pieces from her True Love series. 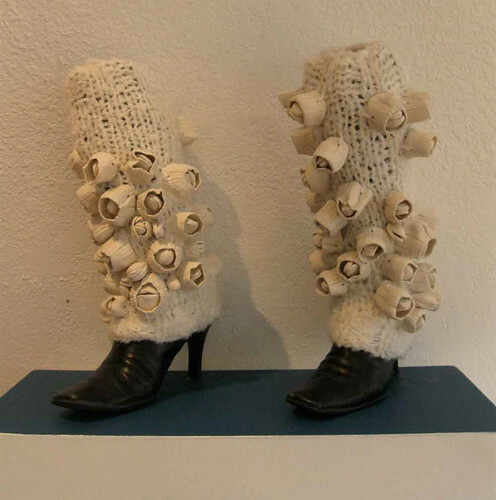 The pieces, mixed media creations of fibers and porcelain, utilize numerous, almost identical pieces, crocheted into familiar clothing forms (a shawl form and leg warmers). These are love stories, both happy and sad, the repeated action (of their creation) enforcing lessons learned. Andrea Peterson is an artist committed to working with the environment as an equal. 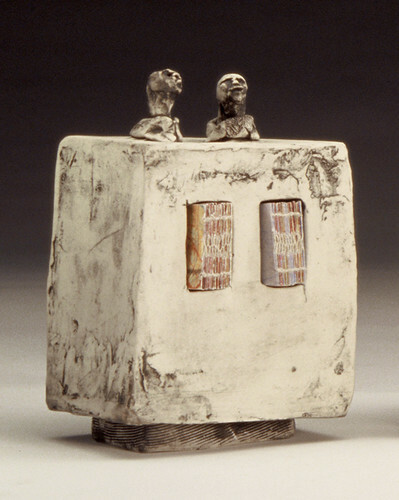 The two works on display incorporate paper and wood-fired clay made on her farm in Indiana, where she and her family live and work in an atmosphere free from the distractions of technology. Consistent with this lifestyle, her works reference environmental responsibility alongside a playful curiosity. Another artist concerned with environmental equality is Californian Judith Serebrin. 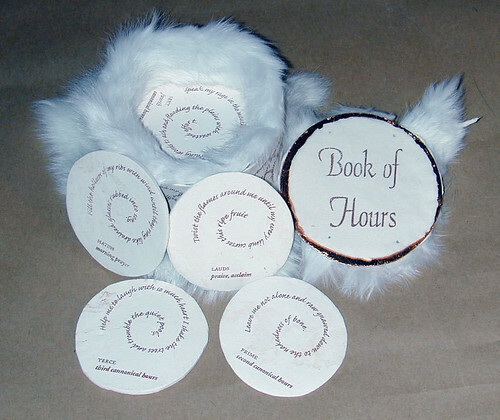 On display are three works from her Soul Books series. Hand-built porcelain figures both animal and human, house books in cavities created for this content, which speaks to the decided lack of consideration for the individual and collective souls of life on planet earth. A Denver favorite, Marie EvB. Gibbons translates her experience into sculptural narrative with use of form and metaphor. She combines figurative and organic forms to share memories and stories. The appeal of the familiar object in her work is designed to encourage viewers to stop and consider some of their own memories and stories. Gallery director Alicia Bailey, whose commitment to artists’ books and related arts is the driving force behind Abecedarian Gallery is a studio artist with a broad range of method and material at her disposal. 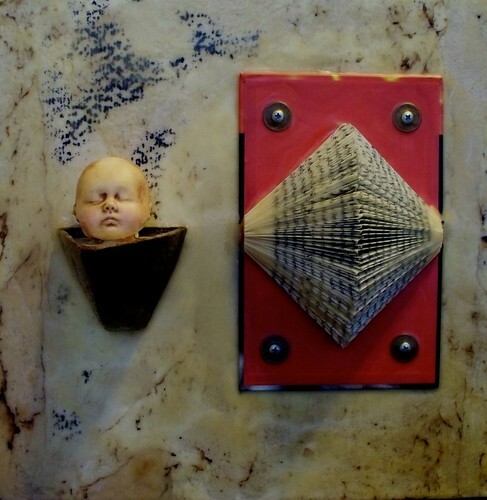 Bailey is driven by a fascination with objects, their histories, stories, their ability to bring order or chaos, their mere presence an indicator of the inevitability of change, Here she exhibits traditional book forms (coptic, accordion, codex etc.) 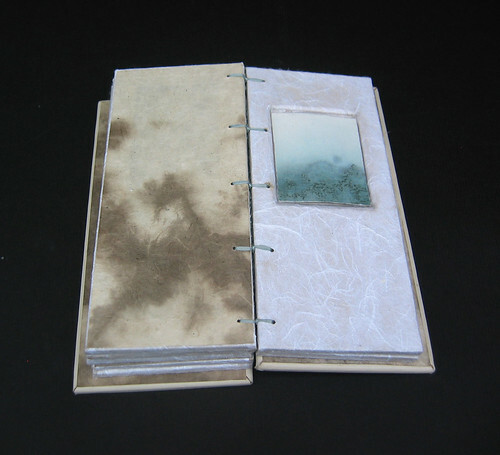 created from materials not generally associated with bound books, using these forms as repositories for notions of the inevitable quirkiness of objects. 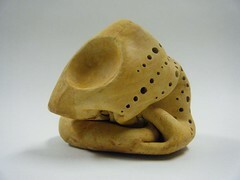 This entry was posted in 2011 Exhibitions, Ceramic Soliloques.